One or more photo(s) has been virtually staged. STUNNING Executive Pool Home in the exclusive GUARD GATED community of WATERCHASE never before on market! BEAUTIFUL HOME + BRAND NEW ROOF (2018)! 4 Bedrooms + Executive Office + Enclosed Craft Room + Bonus Loft, 3.5 Bathrooms, 3,510 Sq Ft, 3-Car Split Garage, Separate Service Entrance, GORGEOUS $68,000 POOL/SPA located on PRIVATE CONSERVATION just under 1/4 Acre! Architectural changes at construction incl HUGE DOWNSTAIRS MASTER SUITE & LARGE MASTER BATH w/Double Vanities + Two LARGE WALK-IN CLOSETS, three XL Guest Bedrooms upstairs, one LARGE GUEST SUITE features ensuite full bath + IMPACT RESISTANT WINDOWS THROUGHOUT! This GORGEOUS HOME features Soaring Ceilings, PLANTATION SHUTTERS, ELEGANT COLUMNS, CROWN MOLDING, 5 1/4" Baseboards, NEW INTERIOR PAINTING, upgraded Ceiling Fans & Light Fixtures, Custom Built-Ins in Family Room, HUGE GOURMET KITCHEN w/Island+Abundance of Cabinetry/Storage, LARGE BREAKFAST NOOK & FAMILY ROOM overlooks pool, Half Bath downstairs, Storage Area under stairs, SPACIOUS FORMAL LR/DR, Office w/French Doors, Master Suite has French Door to pool+Large Windows offering BEAUTIFUL CONSERVATION VIEWS! 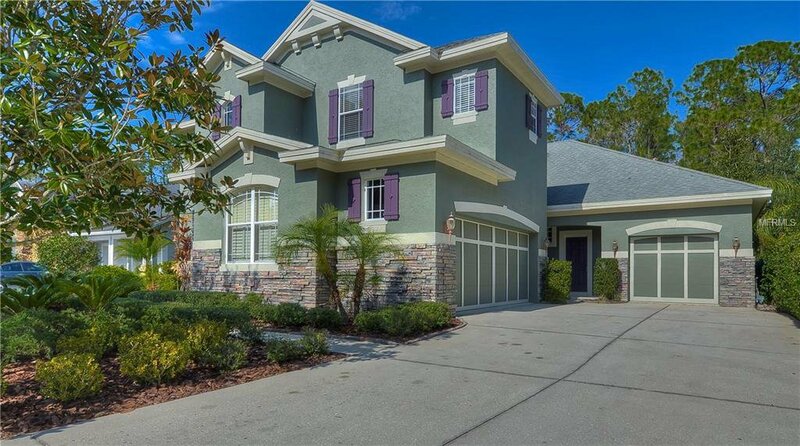 Waterchase provides highly SOUGHT AFTER SCHOOLS, quick commute to TIA, downtown Tampa, Westshore, minutes to shopping, restaurants & 1/2 hr to BEAUTIFUL FL BEACHES! Enjoy an abundance of community amenities: RESORT STYLE POOL, Fitness Center, BEAUTIFUL CLUBHOUSE, Tennis/BBall courts, Playground & on-site activity director! Listing courtesy of TOWN CHASE PROPERTIES. Selling Office: KELLER WILLIAMS REALTY.